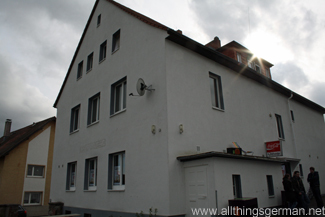 I must have driven past the building that houses the Jugendtreff or youth club in Oberstedten – part of Oberusel – many times without realising that it is there. For me, the building housed the local Amtsgericht or court, but yesterday I found out just how much more goes on in there. The room has been restyled and redecorated, and yesterday the grand opening took place with a number of the town’s dignitaries in attendance. And whilst it is just one room that is available for Oberstedten’s teenagers to meet in, that room is not just a big open space. 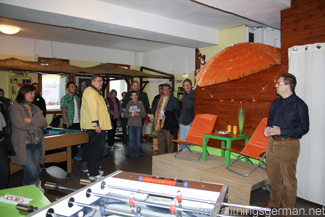 Following a “beach bar” theme, there are corners where people can sit and chat but also an open space that contains a table-top football game (“Kicker”) and a pool table. There is also plenty of space outside that can be used in the summer months. 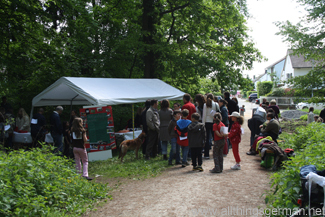 The residents of Oberstedten, the part of Oberursel that lies between the northern end of the town and Bad Homburg, have been relatively unaffected by the Hessentag so far. This will change tomorrow (Monday 13th) when the Hessentagsmarathon takes place and runs partly through their streets as well. The marathon starts at the Marktplatz and after going through the town, but thankfully not crossing an of the railway lines, it goes out along the Maasgrund through the woods to the Hohemark.